Wow, are we glad we found you...we need your help! It's a week before Christmas, and our lead tenor has developed laryngitis! We told him not to practice day in and day out, but he just wouldn't listen; he lives for caroling. Anyway, we're in desperate need of a new member to round out our sound as we carol our way through the holiday. And a little bird told us that you have amazing range and pitch, along with an abundance of holiday spirit! We'll make it easy for you. We already have the music printed up, and you don't even need to worry about what to wear. 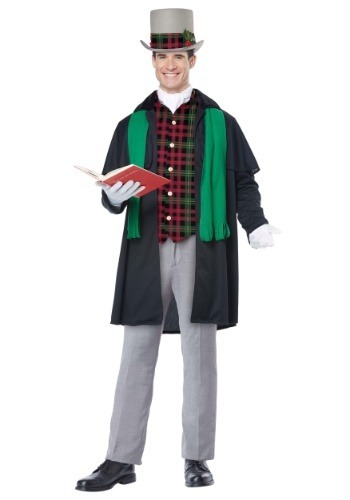 Just slip into this Men's Holiday Caroler Costume and you'll fit in with our band of merrymakers, just like that! Did we mention it'll be fun and festive? Did we mention it will spread joy across the neighborhood? Did we mention you get to wear a top hat? Yes, that's the spirit! You won't regret this decision. And as a bonus, you now have a bonafide caroler costume rarin' to go the next time you need it. This great look centers around a plaid vest in classic Christmas colors, worn under a black coat with a cool capelet. A white neck scarf can be tied to Victorian-era perfection, while the top hat (as promised) has a matching plaid ribbon and even a sprig of holly for added holiday cheer. You'll want the gloves and scarf to keep you warm, but we also plan on bringing mugs of hot cocoa and warming up by the fire after we finish! We can't thank you enough for stepping in—it really is saving the holiday! Now everyone will get to enjoy classic Christmas carols, presented in classic costumed fashion. Then again, you get a little something out of this too: the joy of spreading joy! Not to mention, this totally timeless costume.